One of most relevant financial issues of contemporary medical reimbursement is known as Incurred but Not Reported (IBNR) claims. IBNR claims are an indirect result of prospective payments systems, the insurance industry and commercial risk contracts, and to some extent fee-for-service medicine. IBNR claims represent a risk and an opportunity for managed care companies, healthcare organizations, clinics, and medical providers alike. Medical groups, Group Practice Without Walls (GPWW), clinics, physician-hospital organizations (PHs), independent practice associations, hospitals, and other managed care organizations (Moss) first began experimenting with and accepting reimbursement for medical services according to a prospective payment system (PPS) several decades ago. It was not until recently that this type of insurance payment achieved critical mass as capitated and other medical risk contractors faced a potentially significant tax burden for IBNR claims. IBNR is an industry term referring to those claims that actually result in a medical service or healthcare cost prior to the end of a reporting period for which the insuring entity has not received a bill from the provider or other healthcare entity. This issue originally began related to self-funded employer plans that were ostensibly operating as an insurance company. The Internal Revenue Service (IRS) ruled on several occasions that self-funded employer groups could not deduct IBNRs because the deduction was based on an educated guess or estimate, and still generally maintains that any reserve based on estimates reflected in the tax return of non-insurance company entities will be denied. For purposes of financial consistency, medical provider organizations typically report their financial results according to generally accepted accounting principles (GAAPs) that require organizations to accrue IBNRs in their financial statements in order to not overstate earnings. Of course, the IRS is not as interested in organizations overstating earnings as private investors, shareholders, and stockholders might be. tax consequences of IBNRs relative to the above. THE MUNICIPAL HOSPITAL CLINIC, INC. 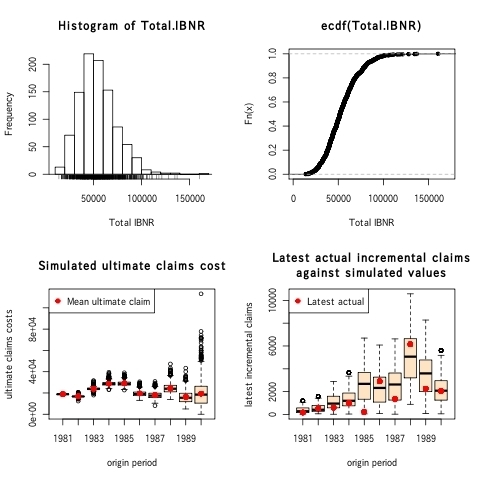 The Municipal Hospital Clinic, Inc. uses the historical cost analysis method of similar established organizations to estimate IBNR calculations. It is based on the actual number of past claims on a per member/per month basis. If the Municipal Hospital Clinic treated 5,000 and 6,000 HMO members respectively in two months, the total member year-to-date months would be 11,000 or 5,500 per month. Therefore, if submitted medical costs were $3, and there were 11,000 members for the period, the total IBNR estimated reserve fund would be $33,000. – Estimated comparable reserve fund analysis? 2) Can you explain why it might be suggested that two to three times the average historical cost analysis claims history be retained in the IBNR reserve fund for the Municipal Hospital Clinic, Inc? We are glad to offer you service of dumps selling. All discovers cost 25$ each. 100 AND MORE, INDIVIDUAL PRICE FOR EVERY COSTUMER.